Nairobi National Park is a national park in south-central Kenya. Established in 1946, it was a project of Mervyn Cowie, a conservationist who pioneered the national park system in Kenya, and established this as the nation's first. It is located approximately 7 kilometers (4 mi) south of the center of Nairobi, the nation's capital and largest city. Only a fence separates the park's wildlife from the metropolis, with Nairobi's skyscrapers providing a backdrop to the park. The proximity of urban and natural environments has caused conflicts between the animals and the local population, and threatens animals' migration routes. While Cowie did not anticipate the immense growth of Nairobi, such a large city next to an animal reserve presents unique problems to both man and wildlife. These issues, if dealt with successfully, have the potential to make of Nairobi National Park a model in the larger context of mans' relationship with nature. Despite its proximity to civilization and its relatively small size, Nairobi National Park boasts a large and varied wildlife population. The dry transitional savanna ecosystem provides for such mammals as the black rhinoceros, elephants, gazelles, giraffes, lions, zebras, and various species of antelope. There are also numerous reptiles and hundreds of species of birds. The Nairobi Animal Orphanage, founded in 1963 with the purpose of saving orphaned elephants and rhinos and releasing them back into the wild, is located inside the park. Nairobi National Park is a tropical savanna. British colonists arrived in the area where the park is located in the late 1800s. At this time, the Athi plains east and south of what is today Nairobi had plentiful wildlife. Nomadic Maasai lived and herded their cattle among the wildlife. Kikuyu people farmed the forested highlands above Nairobi. As Nairobi grew—it had 14,000 residents by 1910—conflicts between humans and animals increased. Residents of the city carried guns at night to protect against lions. People complained that giraffes and zebras walked on and ruined their flower beds. Animals were gradually confined to the expansive plains to the west and south of Nairobi, and the colonial government set this area aside as a game reserve. Settlers from Nairobi including Isak Dinesen, author of Out of Africa, rode horses among gazelles, impala, and zebras in this reserve (Morell 1996). The conservationist Mervyn Cowie was born in Nairobi. Returning to Kenya after a nine-year absence in 1932, he was alarmed to see that the amount of game animals on the Athi plains had dwindled. Expanding farms and livestock had taken the place of the game. He later recalled this place as a paradise that was quickly disappearing. At this time, the area that would later become Nairobi National Park was part of the Southern Game Reserve. Hunting was not permitted in the reserve, but nearly every other activity, including cattle grazing, dumping, and even bombing by the Royal Air Force was allowed. Cowie began to campaign for the establishment of a national park system in Kenya. The government formed a committee to examine the matter. Officially opened in 1946, Nairobi National Park was the first national park established in Kenya (Brett 1995, 11). Masai pastoralists were removed from their lands when the park was created (Porteous 2001, 132). Cowie was named as director of Nairobi National Park and held this position until 1966. In 1989, Kenyan President Daniel arap Moi burned 12 tons of ivory on a site within the park as a gesture to persuade the world to halt the ivory trade. The fire was intended as a statement of the Government's political will to stop the poaching that has reduced Kenya's elephant herds to 17,000 from 65,000 in 1979. This event ultimately improved Kenya's conservation and wildlife protection image. 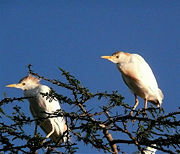 Nairobi National Park has hundreds of species of birds, both permanent and migratory. A common wildebeast in Nairobi National Park. Zebras and giraffes side by side in Nairobi National Park. Lion in Nairobi National Park. Nairobi National Park, located about 7 kilometers (4 mi) from the the center of Nairobi, covers an area of 117.21 km² (45.26 sq mi) (28,963 acres) and is one of the smaller of Africa's national parks (Brett 1995, 11). The park ranges in altitude from 1,533 to 1,760 meters (5,030 - 5,774 ft) and has a dry climate. It is the only protected part of the Athi-Kapiti ecosystem, making up less than 10 percent of this ecosystem (Prins 2000, 142). The park has a diverse range of habitats and species. The park's northern, eastern, and western boundaries are enclosed by an electric fence in order to keep the wildlife from roaming into the city. 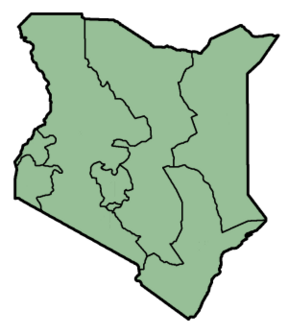 Its southern boundary is formed by the Mbagathi River. This boundary is not fenced and is open to the Kitengela Conservation Area which is located immediately south of the park, and the Athi-Kapiti plains. There is considerable movement of large ungulate species across this boundary. The park's predominant environment is open grass plain with scattered Acacia bushes. The western uplands of the park have highland dry forest with stands of Olea africana, Croton dichogamus, Brachylaena hutchinsii, and Calodendrum. The lower slopes of these areas are grassland. Themeda, Cypress, Digitaria, and Cynodon species are found in these grassland areas. There are also scattered yellow-barked Acacia xanthophloea. There is a riverine forest along the permanent river in the south of the park. There are areas of broken bush and deep rocky valleys and gorges within the park. The species in the valleys are predominantly Acacia and Euphorbia candelabrum. Other tree species include Apodytes dimidiata, Canthium schimperiana, Elaeodendron buchananii, Ficus eriocarpa, Aspilia mossambicensis, Rhus natalensis, and Newtonia species. Several plants that grow on the rocky hillsides are unique to the Nairobi area. These species include Euphorbia brevitorta, Drimia calcarata, and Murdannia clarkeana. The park has a high diversity of bird species, with up to 500 permanent and migratory species in the park. Dams have created a man-made habitat for birds and aquatic species. 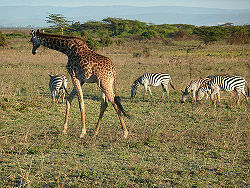 Herbivores, including wildebeest and zebra, use the Kitengela conservation area and migration corridor to the south of the park to reach the Athi-Kapiti plains. They disperse over the plains in the wet season and return to the park in the dry season. The concentration of wildlife in the park is greatest in the dry season, when areas outside the park have dried up. Small dams built along the Mbagathi River give the park more water resources than the outside areas and attract water dependent herbivores during the dry season. The park is the northern limit for dry season wildlife migrations. The David Sheldrick Trust runs a sanctuary in the park that hand-rears orphaned elephant and rhinoceros calves, and later releases them back into secure sanctuaries. Orphaned and sick animals are brought to the sanctuary from all over Kenya. The sanctuary, which was opened in 1963, is near the park's main entrance. It was set up by Daphne Sheldrick after the death of her husband, the anti-poaching warden of Tsavo National Park. (Hodd 2002, 115-117). Nairobi National Park is sometimes called Kifaru Ark, which means "Rhinoceros Sanctuary" (Bailey 2007, 60). It is one of Kenya's most successful rhinoceros sanctuaries, and it is one of only a few parks where visitors can be certain of seeing a black rhinoceros in its natural habitat. 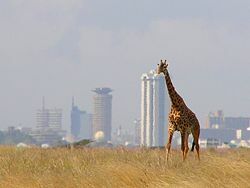 A giraffe in Nairobi National Park, with Nairobi's skyline in the background. Mervyn Cowie, a conservationist who pioneered wildlife protection and the development of tourism throughout East Africa, was born in the colony that became Nairobi in 1909. His youth was spent in a small settlement intermingled with wildlife. After attending Oxford University in England, he returned to Kenya in 1932. He reports to have been "alarmed by seeing how the game on the Athi plains had dwindled, where there had been 1,000 animals, you saw only 100" (Morell 1996). His response was to campaign for a national park system in Kenya. By 1939 the boundaries of Nairobi National Park had been set. The park officially opened its gates at the end of World War II, with Cowie as director. He went on to oversee the development of several of Kenya's national parks. Before the city was established, herds of animals followed the rains and moved across the plains from Mount Kilimanjaro to Mount Kenya, a migration as great as the migration that takes place on the Serengeti. However, as the city grew the park became the northernmost limit of the animals' migration. Migrating animals can reach their southern pastures by traveling through the Kitengela section of the Athi plains. This land is very important to their migration routes, but growth in the human population and the accompanying need for land threaten to cut off this traditional migration route from the park to land further south. The park's migratory species are also threatened by changing settlement patterns, fencing, and their closeness to Nairobi and other industrial towns. These activities fragment their ecosystems and occupy their habitat (Prins 200, 142). Cowie's design of national parks focused on the visitor. This emphasis helped to make tourism Kenya's primary industry. However, it exacerbated problems between the human population and wildlife. Farmers living next to the parks did not have input into the parks' establishment. Locals received little benefit from the game animals. The nearness of the urban setting to the park creates human-animal conflicts. Effluent and industrial waste from factories located along the park's northern boundary contaminate the park's surface and ground water systems, while pollution naturally resulting from the large city is generally detrimental to wildlife. The park is under pressure from the city's growing population and need for farmland. Treaties with the Masai in 1904 and 1911 required them to cede all of their northern grazing lands on the Laikipia escarpment near Mount Kenya. Some of those who lost land there were resettled in the Kitengela area. The Masai's pastoral life was not in conflict with the wildlife, but the ranching and farming of today is. From the other perspective, houses, cultivated plots, schools, and shops, are found on the Kitengela plains—all subject to the presence of predators. Some of the park's revenues have been used for community projects on the Kitengela. A significant number of Masai landowners have formed the Kitengela Landowners Association, which works with the Kenyan Wildlife Service to both protect the wildlife and find benefits for the local population. In 1948, 188,976 people lived in Nairobi, but by 1997 the city's population had grown to 1.5 million. This is an issue Cowie did not foresee, but one which must be dealt with if Nairobi National Park is to survive. Velvet monkeys in Nairobi National Park. Nairobi National Park is the main tourist attraction for visitors to Nairobi. Visitor attractions include the park's black rhinoceros, diverse bird species, cheetah, hyena, leopard, and lion. Other attractions are the wildebeest and zebra migrations in July and August, the Ivory Burning Site Monument, and the Nairobi Safari Walk and animal orphanage. The park is also popular with Nairobi's residents, and thousands of African children on school field trips visit the park each week. The park's Wildlife Conservation Education Centre has lectures and video about wildlife, as well as guided tours of the park and animal orphanage. These tours are primarily, but not exclusively, to educate school children and local communities. The Kenya Wildlife Service has created a Safari Walk that highlights the variety of plants and animals native to Kenya, and their benefit to the country's population. ↑ 1.0 1.1 World Database on Protected Areas. Nairobi National Park Retrieved January 13, 2009. ↑ 2.0 2.1 Francis Chamberlain. August 21, 1996. Obituary:Mervyn Cowie The (London) Independent. Retrieved January 13, 2009. ↑ Jane Perlez. July 19, 1989. Kenya, In Gesture, Burns Ivory Tusks New York Times. Retrieved January 13, 2009. ↑ 4.0 4.1 4.2 Kenya Wildlife Service. Nairobi National Park Retrieved January 13, 2009. ↑ Marc Lacey. March 10, 2003. Nairobi National Park Journal; In Africa, Oddly, Animal World Is Terra Incognita New York Times. Retrieved January 13, 2009. Bailey, William D. (2007). You Will Never Run Out of Jesus. Hannibal Books. ISBN 0929292243. Retrieved January 13, 2009. Brett, Michael and Christine Riley (1995). Kenya the Beautiful. Struik. ISBN 1853685577. Retrieved January 13, 2009. David Sheldrick Wildlife Trust. David Sheldrick Wildlife Trust Retrieved January 14, 2009. Hodd, Michael (2002). East Africa Handbook: The Travel Guide. Footprint Travel Guides. ISBN 1900949652. Retrieved January 13, 2009. Honey, Martha (1999). Ecotourism and Sustainable Development: Who Owns Paradise?. Island Press. ISBN 1559635827. Retrieved January 13, 2009. Kenya Wildlife Service. Nairobi National Park Retrieved January 13, 2009. Morell, Virginia. July-August 1996. Surrounded! - civilization is encroaching on Nairobi National Park in Kenya - Nairobi's Wild Side International Wildlife. Retrieved January 13, 2009. Porteous, J. Douglas and Sandra Eileen Smith (2001). Domicide: The Global Destruction of Home. McGill-Queen's Press. ISBN 0773522581. Retrieved January 13, 2009. Prins, Herbert and Jan Geu Grootenhuis, Thomas T. Dolan (2000). Wildlife Conservation by Sustainable Use. Springer. ISBN 0412797305. Retrieved January 13, 2009. Riley, Laura and William Riley (2005). Nature's Strongholds: The World's Great Wildlife Reserves. Princeton University Press. ISBN 0691122199. Retrieved January 13, 2009. History of "Nairobi National Park"
This page was last modified on 6 November 2018, at 00:34.